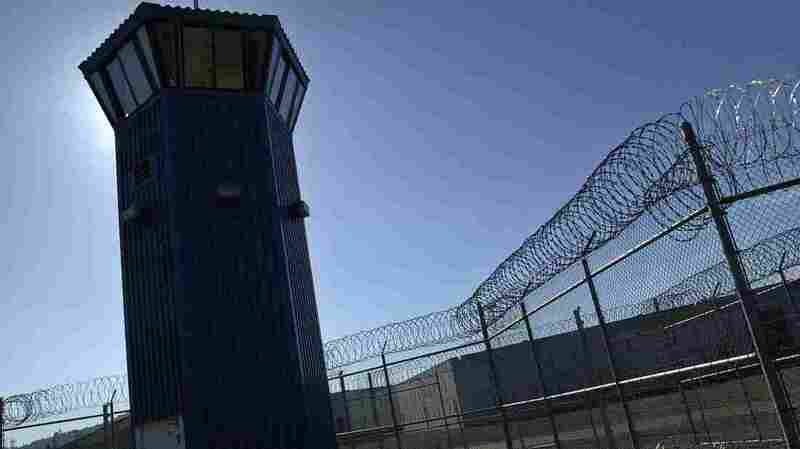 A watchtower rises above the maximum security complex at Pelican Bay State Prison near Crescent City, Calif.
Thousands of prisoners across the state are expressing solidarity with inmates being held in solitary confinement at Pelican Bay State Prison in Northern California. They began refusing meals on Monday. Problem inmates at the Pelican Bay maximum security facility are held in the Security Housing Unit. Some inmates have been in the SHU, pronounced "shoe," for decades. The SHU is a place to put the "worst of the worst," says Michael Montgomery, a reporter for member station KQED and the Center for Investigative Reporting, a nonprofit news organization in Berkeley, Calif.
"Men are placed in there after the Department of Corrections has determined they are prison gang members or that they have done really bad things in prison," Montgomery tells Morning Edition host Renee Montagne. At one time 30,000 inmates joined the hunger strike, but that number has dropped to below 29,000, according to The Associated Press. Pelican Bay "inmates were able to coordinate the hunger strike through letters and visits, and families and advocates have helped get the word out to prisons throughout the state," Montgomery says. The hunger strike was planned after Gov. Jerry Brown declared in January that the prison crisis was over and called on federal officials to end "intrusive" oversight of the state's prisons. In the past two years, three hunger strikes have been conducted to protest conditions in the state's prisons. After the 2011 hunger strike, some requested changes were made. One of the most unusual restrictions that had been imposed on the inmates in the security units was a ban on photographs — which Mongomery says was "really hard on families." Since Pelican Bay is near the border with Oregon and most of the men are from Southern California, Montgomery says, he found situations where families hadn't seen images of their incarcerated relatives for 20 years. When the ban was lifted, "all of a sudden, these young men were old men." The Center for Investigative Reporting project "Solitary Lives" is posted here.